Sunday the daily deal at Michaels was Duck Tape brand duct tape 2 for $6. I bought some with no particular project in mind, but because if I had gray tape my dad would try to put it in his toolbox after helping me with a home improvement project. But when I pull out the hot pink duct tape, he says I know that’s yours! I had painted my basement door with chalkboard paint because I wanted a place to write my tabata workouts and I thought I’d get scrap wood from my dad to create a frame. 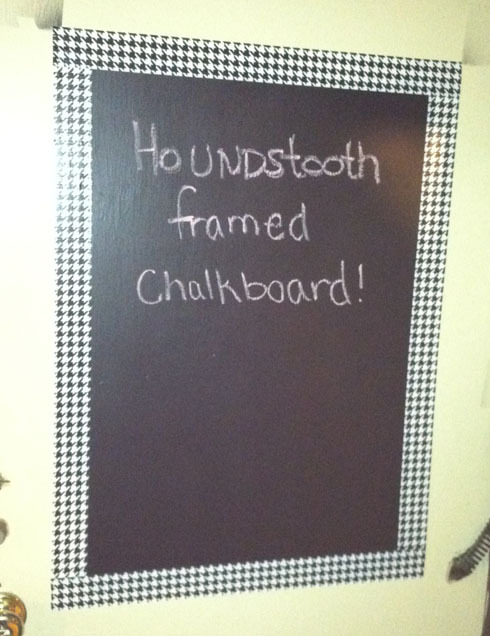 Then I had a brilliant thought (and probably the only one for the week) to use my houndstooth duct tape to frame the chalkboard. The door was ugly to begin with, but replacing it was going to cost $1300 for labor and a special cut metal door (because the opening is odd dimensions). Now, I have something fun in my basement to look at when I’m busting it up! Oh yea, there’s a little overspray from the chalkboard application but oops! Great use of the houndstooth tape! I love it! What a great idea! I didn’t even know houndstooth duct tape existed. Thanks for stopping by Lindsay & Deana! Emmy, I didn’t either until I was digging around in the bin. Their website doesn’t even show it. There was polka dots, tie dye, zebra, hot pink zebra, camo and more I cannot remember.